Austria conjures up Riesling and Grüner Veltliner but the wines Austrian wine producer Dorli Muhr presented us with were from the red varietals Syrah and Blaufränkisch. Her path to becoming a wine producer is an interesting one. Born in Carnuntum in Austria to parents who are farmers, she is an entrepreneur and set up her own PR business whilst still studying. Her field of expertise is the good things in life but most specifically food and wine. When she met her husband Dirk van der Niepoort of Douro fame they decided to produce wine together. But Dorli was very particular about what kind of wines she wanted to make. No jammy notes, the wines had to be fresh and elegant. Austria seemed to be the ideal place to produce Dorli’s style of wine. She thus left Portugal where she had been living and with Dirk she set up her winemaking venture where she was born, in Carnuntum. Carnuntum is today one of the eight wine regions in Niederösterreich (Lower Austria). During Roman times, Carnuntum was an army camp and a trading centre. In the 18th century the composer Joseph Haydn was born not far from the ancient Roman settlement, in Rohrau which is where the Muhr-van der Niepoort winery is located. In Lower Austria Grüner Veltliner is the main grape variety (44%) but in the region of Carnuntum it is red grape varieties that thrive thanks to gravel, loam, loess and sandy soils. The region’s vineyard area is 910 hectares and the main grape varieties are Zweigelt and Blaufränkisch. Dorli Muhr’s vines are situated on the south facing slopes of the Spitzerberg, a 300 m elevation at the beginning of the Alps and the Carpathian Mountains. The region is regulated by the Pannonian climate: dry in the spring, very hot in the summers and cold in the winters. Other influences on the temperatures are the Danube and Lake Neusiedl (Neusiedlersee). She started off in 2002 and that year her output was 400 bottles. Now she has 12 hectares of vineyards and produces 35’000 bottles per year. She tried all sorts of different grape varieties. Syrah turned out to be interesting and well suited to the terroir as for Blaufränkisch it has a long tradition on the Spitzerberg’s calcareous soil. Winemaking choices focus on keeping the wines bright, fresh and floral. Grapes are picked before they get too ripe. There is no sorting table in the winery but all the selecting process is carried out in the vineyards when the grapes are harvested. No sulphur dioxide is added to the grapes at harvest. Grapes are destemmed with a proportion of bunches kept whole. Dorli uses natural yeast, smallish wooden fermenters and with no pumping over. Temperature during fermentation does not go above 26°-27° C which helps to maintain the freshness in the wines. Her reds are kept in barrels for two years for maturation. She racks them once before bottling. For the 2006 vintage, Dirk van der Niepoort was stuck in Portugal and Dorli ended up having to work it on her own. She was nevertheless successful in her endeavours and her 2006 Spitzerberg wine earned her 93 Parker points. After managing a second vintage on her own (2007), Dorli decided to hire a winemaker to help her out – she still had her PR agency to run. From 2008-2011 the South African winemaker Craig Hawkins (now @Lammershoek and creator of the Testalonga label) was responsible for the winemaking. The wines Dorli showcased at the tasting organised by the Swedish Import company Terrific Wines (www.terrificwines.se) were single varietals made from Syrah and Blaufränkisch. Blaufränkisch is an indigenous grape variety from Austria where it is the most planted red variety after Zweigelt. It can be made in a variety of styles from light to complex and can be unoaked or barrel matured. It is also good at expressing the characteristics of a region, Spitzerberg being one of them. Muhr-Van der Niepoort, Sydhang 2011, Carnuntum, Austria. Dorli is not keen on having the name varietal on the label. 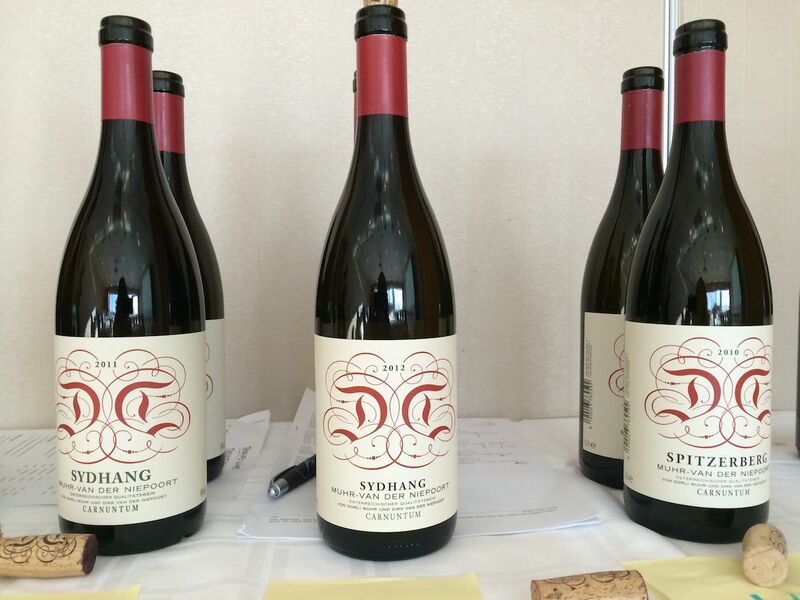 She has settled for the name Sydhang which contains the first two letters of the varietal (Syrah) but means south facing. 2011 was hot and dry, a perfect year for Syrah. Tasting note: Smoke, white pepper, burnt red fruit, dark fruit; Fresh and concentrated (ed.). Muhr-Van der Niepoort, Sydhang 2012, Carnuntum, Austria. Tasting note: Liquorice, smoke, fresh and floral, mineral and well structured (ed.). Muhr-Van der Niepoort, Spitzerberg 2010, Carnuntum, Austria. 2010 was a bad vintage. Dorli’s total yield was reduced to 40%. Tasting note: Beautiful cherry colour, light, fresh, smooth, with red cherries, toastiness and dryness on the palate (ed.). Muhr-Van der Niepoort, Spitzerberg 2011, Carnuntum, Austria. Tasting note: Fresh blue flowers, green leaves, smokiness on the nose; on the palate, fresh acidity, fine tannins, blue fruit, blueberries, cherries, lightness, a long length and chalky minerality (ed.). Muhr-Van der Niepoort, Spitzerberg 2012, Carnuntum, Austria. Tasting note: Fresh acacias flowers wafting through peppery, earthy and fruity notes. Delectable dark fruit, cherries, elegance and fresh acidity (ed.). Stockists worldwide can be found on http://www.wine-searcher.com. Maria Luz Marin had been dreaming of owning her own vineyards and producing her own wine for a long time. She trained as a winemaker and for many years worked for different companies. Then in the late 1990s it became clear to her where she would like to have a vineyard. It was an area known to her from her childhood, an area that offered good growing conditions for plants and vegetables and that therefore should be suitable for vines. She decided to go for it and she bought some land. At this time in Chile, all vineyards were on flat terrain but Maria wanted something different. She chose a site on steep hills, just four kilometres away from the Pacific Ocean, in the San Antonio region. Her vines have the benefit of cool growing conditions, but viticulture is not easy with strong winds and high humidity bringing with it the threat of fungus disease. She planted 50 hectares with varietals that she knew would do well under the given climatic parameters, i.e. primarily whites such as Sauvignon Blanc, Sauvignon Gris, Riesling and Gewürztraminer. She also has some Pinot Noir and Syrah. Surprisingly she has no Chardonnay, but that is because she is not a huge fan. Riesling was a bold choice and today still there are not many wineries in Chile that have Riesling as it is not a commercial grape variety. Terrific Wines imports to Sweden Maria’s Rieslings and Sauvignon Gris that she took us through with quite a lot of detail. Her vines are planted on all different aspects of her hills. The many orientations, elevations and soil types create more complexity of expression and personality in her wines. For Maria Riesling is remarkably sensitive and, depending on terroir, the time of picking, the type of botrytis, how the wine is made, etc… will have a very wide range of expression from citrus, crisp apple to ripe peach and tropical fruit. Maria keeps her yields low at 1kg per vine. Grapes are hand picked and interestingly she always leaves 2 to 3% of botrytis. The bunches are not crushed, but go through gentle pressing (3-4 hours). The juice is chilled to 5 °C before being racked. Fermentation is kept low at 14-15 °C. Sometimes she stops the fermentation before the wine gets too dry and leaves some residual sugar. She does not have a set protocol but likes to experiment and changes the way she does things every year depending on the vintage and circumstances. Casa Marin, Riesling 2009, Miramar Vineyard, Chile. This wine was bottled in 2010 and has spent 5 years in bottle. 2009 was a good vintage. This wine is a good accompaniment to vegetable soups or as an apéritif according to Maria. It is the driest in the flight of Rieslings with 3.7 g of residual sugar. Tasting note: Very fresh acidity, some sweetness, lemon, lime, grapefruit, orange blossom, a hint of petrol and saltiness, a smooth body with a long toasty finish (12.5% abv) (ed.). Casa Marin, Riesling 2011, Miramar Vineyard, Chile. The wine is made from the same blocks and with the same yield as for the 2009 Riesling but the grapes were picked later, i.e. in the second and third week of April. The weather was hotter than in 2009. Fermentation was stopped early and there is 10.5 g of residual sugar. As this wine is sweeter than the 2009 Maria suggests drinking it with Asian or Mexican style food, as it will go well with soy sauce and hot spice. The wine can be drunk now or can be left to develop for many years. Tasting note: High acidity, sweet on the palate with ripe lemons and limes, honey, saltiness and minerality (12.5% abv) (ed.). Casa Marin, Riesling 2012, Miramar Vineyard, Chile. The sweetness level on this wine is between the 2009 and the 2011. Maria thinks that the balance between sweetness and acidity is better on this vintage. Tasting note: Citrus, lactic notes and breadth on the nose; the acidity fades to give way to softness on the palate, finishing long with saltiness and toastiness. Less acidity on the palate than the 2009 and 2011 (12.5% abv) (ed.). 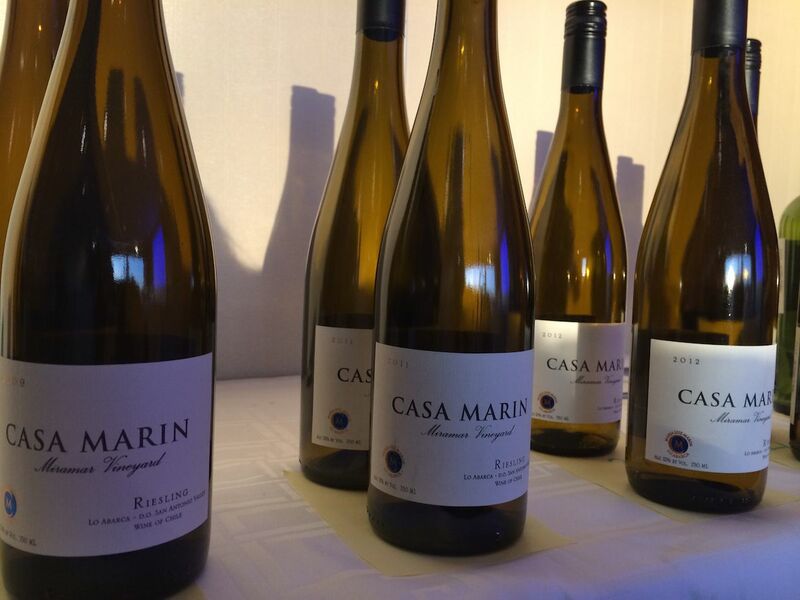 Casa Marin, Riesling 2013, Miramar Vineyard, Chile. Maria decided to stop some of the vats from fermenting and this wine has the highest amount of residual sugar out of the four Rieslings, i.e. 20 g. This wine is more commercial and is aimed at feminine palates. This is the highest amount of residual sugar Maria is prepared to leave in her Rieslings. Tasting note: Fresh lemons, sweetness on the palate, tropical fruit, white peach, sweet lemons, sweet limes, a touch of bitterness and saltiness on the finish (12.5% abv) (ed.). Casa Marin, Sauvignon Gris 2013, Estero Vineyard, Chile. This grape variety is a mutation of Sauvignon Blanc and is not white but pink skinned. It is rustic and wild. It is also tricky to know when exactly it should be harvested. The wine is barrel fermented for seven months in 70% French oak barrels and 30% stainless steel tanks. It is not easy to sell but the UK market really like it. Tasting note: Big bold nose with lemons, orange blossom and gooseberries. Supple, luscious, white flowers, gooseberries, ripe tropical fruit, a little spice and balanced acidity (ed.). Quite in contrast to the Terrific Wines tasting was Go West, a US West Coast showcasing with wines from California, Oregon and Washington. The event featured approximately 80 exhibitors, for 200 producers and more than 700 wines. With wines beckoning from every corner of every room – and there were many of them – it was easy for the ambling visitor to become quite dizzy and to have to adopt a strategic approach to make headway. The event started off with a tutored tasting exploring the style of California wine and its recent evolution. 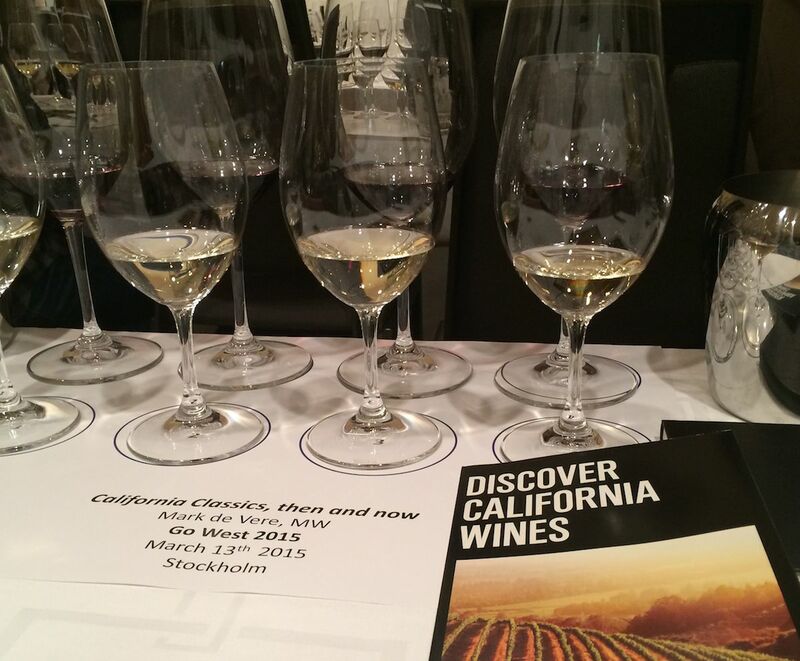 California Classics, then and now presented by Master of Wine Mark de Vere led us through a tasting of wines made from California’s signature grape varieties, Chardonnay and Cabernet Sauvignon. 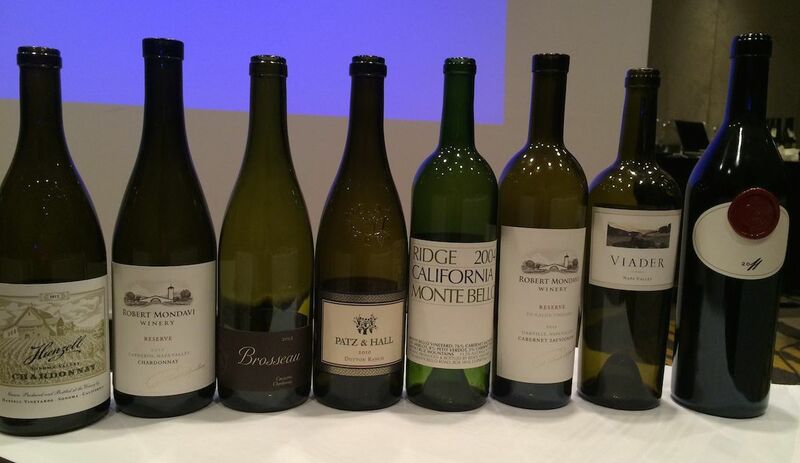 Four white wines and four red wines were selected from different producers in California. Hanzell Vineyards was founded in the 1950s and is one of the old classics. Some of the original old vines are used for the 2012 Chardonnay. This is not quite what one would necessarily expect from a California Chardonnay: 25% has been barrel fermented and has gone through the malolactic fermentation, 75% is fermented in stainless steal and the malolactic has been blocked. Hanzell also do skin contact to give more texture, a process that some consider “old style”. They practice sustainable viticulture. Tasting note: Delicate wood on the nose, fresh citrus, grapefruit, long length, balanced alcohol (14.5%) (ed.). This wine is made in a restrained style but as it is being tasted after the Hanzell Vineyards Chardonnay, it comes across as slightly forward. The grapes are grown in vineyards in Carneros, where Sonoma and Napa County meet, close to the cold water of the San Francisco Bay. They have been whole cluster pressed to give the wine a crystal clean finish. Native ferments were used for all blocks bar one. The wine was barrel fermented. Things have moved on since the 1970s and 80s. Vineyard managers would grow grapes and bring them to the winery for the oeonologists to make the wine. Mondavi changed that to working in the vineyard, making it more of an integrated process. In the 1970s US winemakers modelled their wine on European style. Today that attitude has changed. US winemakers want the finesse and elegance of Europe but want to express their AVA. The use of native ferments has also become popular as opposed to cultured yeasts. Tasting note: oak caramel, ripe citrus, coconut, vanilla, tropical fruit, passion fruit. Toasted notes and apple crumble on the finish (ed.). Wells Guthrie, winemaker and owner of the Copain label, worked in the Rhône for a couple of years and is driven mainly by Syrah. Chalone is in the central coast, up in the hills and benefits from the altitude effect. Some areas have limestone soil. Incidentally Chalone performed well at the 1976 Paris Judgement. The Brosseau vineyard was planted in 1976. Wells Guthrie was inspired by Chablis for this wine. He used neutral oak, lees contact and harvested early. 152 cases of this wine was produced. This is a wine that does not match expectations for a typical California Chardonnay. These producers kept their day job when they set up their business. They were looking for small blocks in Russian River. Tasting note: Milky on the nose, smoky, limes, baked rice pudding and ripe fruit, baked apples, long length (ed.). 2004 was a harmonious vintage. The style is focused on a great location in the Central Coast. Most of the Central Coast is influenced by cold winds from the bay. The Santa Cruz Mountains AVA is above the fog and gets more sunshine. The winemaker Paul Draper believes in American oak and the idea for the Ridge Monte Bello wine is to express California, to express terroir. Tasting note: sadly lacking as the wine in my glass was not in condition. To Kalon vineyard is situated in the west of the Oakville AVA, right in the heart of Napa. The soil is alluvial and free draining. 2011 was the coldest vintage since 1952 and was challenging for winemakers. Good wines from that vintage have purity and elegance. This wine has been fermented in an oak tank – a novelty that Mondavi introduced in 2000. It gives subtleness to the tannins. The wine is unfined. The Cabernet has been blended with 6% Cabernet Franc. Cabernet is now the preferred blending varietal, it adds finesse and a flowing sensation on the palate. Tasting note: Milky, pepper, black currants, bell pepper. Smooth tannins, fresh bell pepper and dark fruit. White pepper, fresh acidity (ed.). This wine is a blend of 66% Cabernet Sauvignon and 34% Cabernet Franc. The vineyards are situated north of St Helena on the lower slopes of Howell Mountain. Delia Viader’s wines don’t qualify for the Howell Mountain AVA, however, as the vineyards are just below the boundary. Her vision of her wine is liquid cashmere. The wines are fermented in concrete and stainless steel and aged in oak. They have a rich mouthfeel but a good acidity. Tasting note: Blackcurrant leaves, fresh dark fruit, blueberries and white pepper on the nose, dark fruit, dark chocolate, bell pepper on the palate with coffee on the finish. Big wine with smooth tannins and freshness (ed. ).